Though the unexpected return to public life of David Bowie provides much to be excited about (the lightening-fast news; an achingly naked single 'Where Are We Now? '; a newfound melancholic fragility in his voice; an abysmally baroque video) it was the artwork to the new album The Next Day that intrigued me most. Superficially, it is nearly too clever for its own good, and became a quick and easy target for the internet meme mill. But this cover deserves more sustained attention here, and not just because it's a heroic recycling effort, or an instructional nod to Bowie's precedent glories. The generalized absence of his face is truly an important trope, a work of art unto itself. Nearly every David Bowie record (save for Earthling when he turned his back on us, Reality when he went to the virtual far side, and Lodger when his face was a foot) featured his chiseled visage - always an indicator of cultural currency, of fashion and fame. David Bowie's art is not separate from his life, which seems that of a gentleman who, despite having been on sale for nearly half a century, still remains unconsumed. As with everything he does, Bowie's methods and manoeuvres are deliberate, mannerist to a fault. So why now this about-face? He hadn't shown it much for some time as it was. Still, Bowie's works are not simply stylized; there is no division between form and fashion, style and content. And if album art is its facade, then his ever-changing mask is doubly absent from The Next Day. Bowie is consistently one and the same with his style. His sonic and visual aesthetic sensibilities work in lock stride, and despite the top-secret nature of the record's unveiling, it seems inevitable somehow that this kind of extremely conspicuous facial erasure should be Bowie's current choice of self-representation. In the clip directed by longtime collaborator Tony Oursler, Bowie croons this sad tune with an eyes-down frown, his face like a carnival tableau within a Siamese twin-gendered two-headed plush animal toy - an impossible body. This carnivalesque device is called prosopopeia, the rhetorical strategy of speaking as another figure, a cut-in, inserting the face into an inanimate body, walking the dead, as it were. Writing on this familiar but understudied phenomenon, University of Texas at Austin anthropology professor Craig Campbell argues that juxtaposing one's facial features onto another form is also a radical reconfiguration of the relationship between face and body, an amalgamation, a reanimation, both imagined and real. Campbell writes, "what to one looks like dis-embodiment, to another looks like re-embodiment: the re-constitution of the self. The hybridization of once distinct entities. And, most importantly a statement in favour of fragments." In his astounding book A Voice and Nothing More, Mladen Dolar notes that a disembodied voice nonetheless implies some body, "enough to be cumbersome and embarrassing; in all its living presence it is also like the corpse one cannot dispose of." I believe that Bowie's fragmented bi-body in this newest video signals the collective desire for human extension through prostheses, a future biology, faces stretched out across eternity, over an ideal form - a poignant contemplation on Earthling mortality. Dolar writes, "the voice without a body is inherently uncanny… the body to which it is assigned does not dissipate its haunting effect." The body haunts the voice like the face haunts the body. Faces are layered strata of experience, revealed or concealed historical terrains, media of the most sensitive and subtle communication. And the fragile voice of Bowie's erased face, a face void of a body, is a ghostly voice that haunts itself most. But one way to evade being haunted is to always be the one doing the haunting. Susan Sontag knew, at its essence, that style is soul, and that the soul has a face: "In almost every case, our manner of appearing is our manner of being," she stresses. "The mask is the face." Here, Bowie's familiar superhero mask is concurrently effaced and updated anew. Since 1999's Hours, the man who fell to Earth fairly self-consciously eased into his own golden years, a period characterized by what Edward Said described in his posthumously published 2006 book, On Late Style, as "works that reflect a special maturity, a new spirit of reconciliation and serenity often expressed in terms of a miraculous transfiguration of common reality." 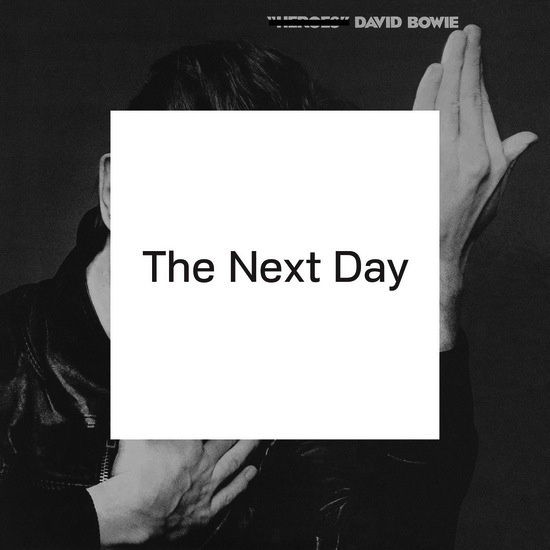 There was really no conceivable way that Bowie could release such a comparatively untimely record without it acknowledging its own absence, without it referring in some way to those which came before it, for it not to be on some level a statement about itself, as well as exercising Bowie's singular commentary on the things that surround him, things that seem important to him, which lately appear more and more to be made of memory. The cover of The Next Day is retrospective, revisionist without being retromaniacal. Through Theodor Adorno's reading of Beethoven's late works, Said meditates on the differences between the body as flesh, which dies, and a significant body of artwork, which does not. Immortal harmony, Adorno believed, could only represent its brooding composer's confrontation with death. Adorno contended that, faced with his own mortality, Beethoven's subjectivity begins to evacuate his later music, leaving "only fragments behind, and communicates itself, like a cipher, only through the blank spaces from which it has disengaged itself." A black-tie-and-white-noise image contained within 2002's Heathen depicts Bowie with blotted-out countenance, eyes blinded, a simultaneous over-saturation and self-effacement. Once again, Bowie returns to this lowly planet, fashionably late, a blank space oddity.